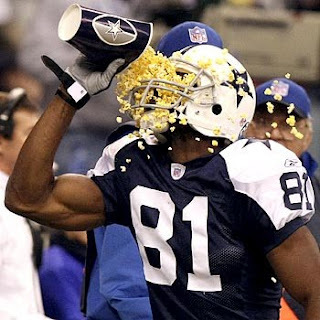 Terrell Owens has been an enigma. His career numbers are worthy of Hall of Fame consideration. His career antics are worthy of raised eyebrows. Guilty of being as talented and physically gifted as any wide receiver of his era, yet at the same time being as frustrating and disrupting as any wideout of his generation. A generation that has embraced the "give me the damn ball" persona that fellow wide reciever Keyshawn Johnson created while playing for the New York Jets early in his career. The position of wide receiver in the National Football League is a demanding one. Requiring its best athletes to possess an air of supreme confidence on the field and apparently off of it as well. Lately the behavior of many of the NFL's premier wide receivers of today has been self serving, irresponsible and narcissistic. Brandon Marshal, Randy Moss, Chad Ochocinco, Carolina's Steve Smith, Vincent Jackson, Santonio Holmes, Mike Sims-Walker, Michael Crabtree, Plaxico Burress, Donte Stallworth, Matt Jones, the late Chris Henry, Anquan Boldin, and T.O. all have made some serious headlines over the last several years. Disturbing actions ranging from shooting themselves accidentally, to vehicular manslaughter. Changing their last name, to admittedly not playing hard on every down. This is the baggage that comes with today's primma donna wide receiver. It should not come as a complete surprise though. Peter Gent an ex-Dallas Cowboy wide receiver known more for his famous book "North Dallas Forty" than catching passes was a pioneer in trouble making. The book which was successfully adapted into a popular motion picture during the 70's shocked the NFL and its fan base. His dirty fiction tell all was basically a biography on America's Team, the Cowboys of the late 1960's and early 1970's exposing the outlandish actions of the world's most popular franchise. Another ex-Cowboy wide out Butch Johnson was one of the first inventor's of the post touchdown celebration. After scoring he would emulate an old gunfighter by pulling out both fingers and blowing on them as if they were smoking six shooters. Andre Rison of Atlanta Falcon fame had plenty of trouble. Not only getting into one of the ugliest on field dust ups with cornerback Deion Sanders but also having his house burnt down by his wife,"Left Eye," a singer from a once popular female hip-hop group. So today's wide receivers are just following in the footsteps of their NFL ancestry. Along with over the top media coverage just adding fuel to an already raging inferno of inflated ego's, this behavior only seems to be multiplied and magnified to fit perfectly onto our flat screens and lap tops. The athlete of today has an appetite for attention. They crave it, they need it and some would almost die without it. We as fans feed there self absorbed and self obsessed cries for love with applause and vindicate their insecurities just because they can run the 40 in 4.3 and jump higher off of the ground than most of us can off of a trampoline. Having stated all of this I still think the Rams should have signed Terrel Owens. He has accumulated 14, 951 receiving yards while hauling in 144 touchdowns, 61 of those for 40 or more yards! He is a physical freak of nature, with the build of 20 something still much in his prime. He may have lost a step, but his swagger and big play ability still surpasses anything the Rams will roster this autumn. His age should not be a factor as other older wideouts have proven in the past. Rod Smith of the Denver Broncos and an alum of Missouri Southern State caught 6 touchdowns and totaled 1,105 yards as a 36 year old. Jerry Rice tallied 1,157 yards and 9 TD's at the same age and All Pro Derrick Mason racked up 1,037 receiving yards at age 34 being targeted by a rookie quarterback named Joe Flacco of the Baltimore Ravens. To compare Donnie Avery last season led the Rams charge with 589 yards receiving and hit pay dirt just 5 times. The media question T.O. 's drive and determination. They question his motives for still wanting to suit up in an NFL jersey at age 36. Well I will tell you why he still wants to play the brutal game that is American football. It is because he has a competitive desire to still win a championship. That is the one thing that his resume' lacks. A Super Bowl ring. He has been to one with Philadelphia, playing that game with an injury that was not fully healed while Donovan McNabb ran out of gas while losing to Tom Brady and New England. His 49er teams never made it to the big game and Tony Romo's Cowboy's have always seemed to be next years champs. Now after a non eventful season playing in Buffalo, where the Bills had fired their offensive coordinator just weeks before the seasons kickoff resulting in a horrible offense. Terrell Owens, aging superstar, needs a home. A home that may not offer him a chance at a ring, but a chance at something maybe even more fulfilling. A chance to instill a winning attitude with a little swagger. A home where he could have molded our young receivers into well rounded versatile wideouts. Sure he's 36 and his once crisp routes may take a little longer to develop, but with age comes wisdom. To me it is about putting the most talented team on the field come September. NFL teams are not supposed to play for draft picks. No matter what his past consists of we should not turn a blind eye toward the numbers that he has put up. Those career statistics are not an accident. They were a direct result of natural talent, hard work and a determination that most pedestrians cannot fathom. So as St. Louis fans anticipate the start of another disappointing gridiron season, they can look forward to their Rams trotting out on to the field pass catching stalwarts such as Donnie Avery, Danny Amendola and Keenan Burton instead of a potential Hall of Fame superstar. A superstar that may have required enough attention from defenses to allow Steven Jackson some breathing room to run and a big enough target for a rookie quarterback to find downfield before being driven to the turf exposing that vulnerable million dollar shoulder. Now please excuse me a moment while I put the popcorn away.